Growing up involved numerous glorious trips to the beach. West coast beaches frequently offer a generous assortment of construction materials, and on many occasions I found myself constructing a driftwood fort. 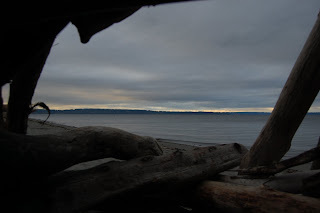 Walking along the beach in Discovery Park, I found a particularly plush fort awaiting my exploration. This driftwood fort featured floorboards, room enough for an adult to get inside, and a superior west-facing view. The craftsmanship was superb.